The Rave Water Whoosh is a slippery, flexible, inflatable activity mat made for fun on the water! 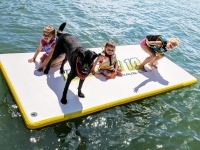 Constructed from commercial grade, durable, drop-stitch material, this water mat provides fun for all ages whether you want to relax, race, slide, or use it as a starting platform for skiing or wakeboarding! Limited Lifetime Warranty against manufacturer's defects. (L x W x H) 21" x 21 " x 9" -31 lbs. 21" x 22 " x 10" - 45 lbs. 22.5" x 21" x 12" -59 lbs.